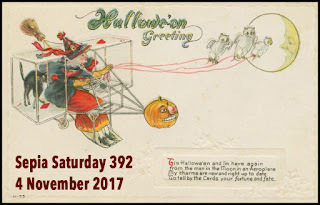 "Tis Hallowe'en and I'm here again". Well, actually, I'm not, I'm off on holiday. But my spirit lives on and is happy to provide you with this week's prompt image, Do with it as you will, but post your post on or around the 4th November 2017. Here are the next two prompts, which - if the system is working well - will automatically be posted at the relevant point of time. 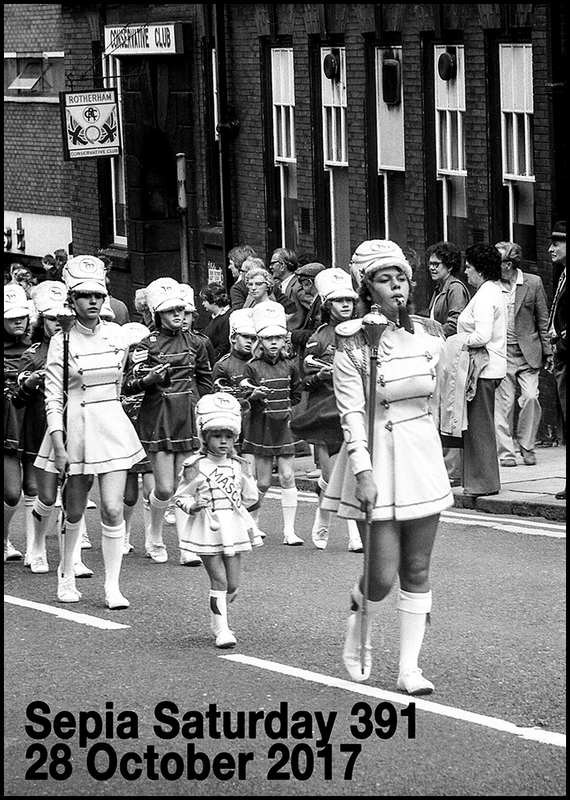 Our theme image this week features a troop of majorettes marching through the streets of Rotherham in South Yorkshire. 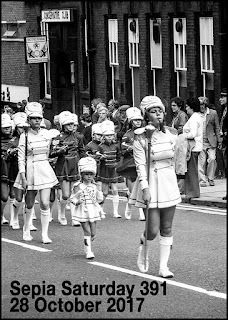 They were, in fact, taking part in the Yorkshire Miners' Gala parade in the early 1980s, and - suitably for the time and the event - they were marching past Rotherham Conservative Club! I have no idea what you are going to make of this as a theme - but street parades, uniforms and galas come to mind. Whatever you go with, simply post your post on or around Saturday 28th October and add a link to the list below. Next weekend is suitably close to Halloween and therefore we have a topical theme. 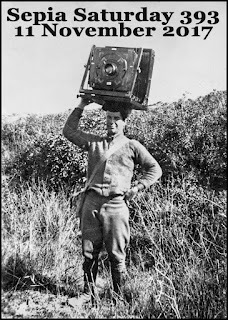 The weekend after we have a photographer on his travels with a rather large camera. 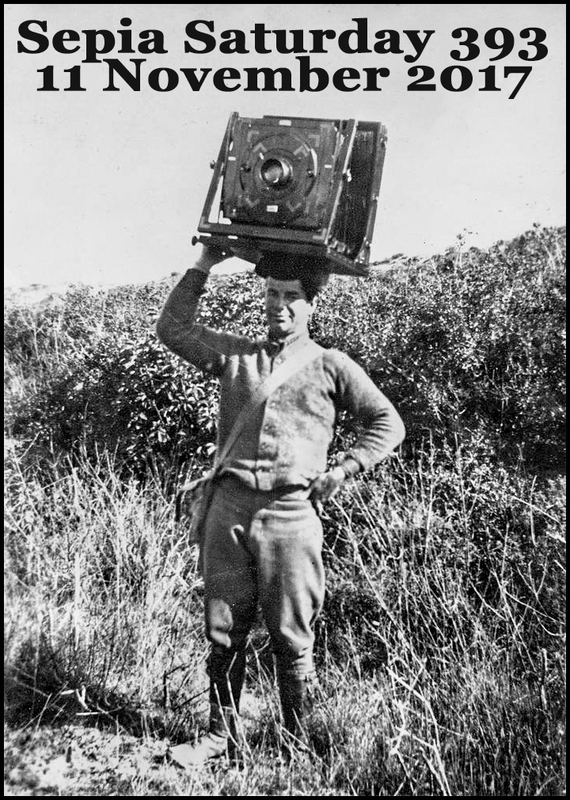 I will be on my travels over the next few weeks - hopefully my camera will be easier to pack than this one! Our Sepia Saturday theme image this week features a young girl standing outside a door (No. 24 as it happens). The photograph comes from a collection of old and unwanted prints I bought on-line - the girl long forgotten, the house long-renovated, the iron railings long melted-down for scrap. There are many potential theme ideas you could follow up - the choice is yours. All you need to do is to post your post featuring an old image on or around Saturday 21st October 2017 and add a link to the list below. 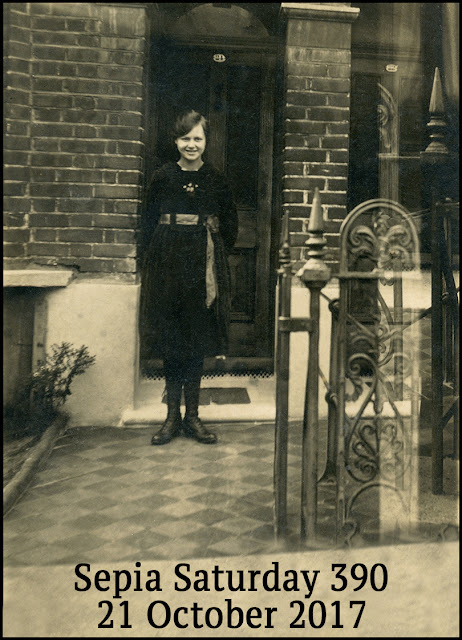 Whilst you wait for someone to answer the door, perhaps you would like to spend a moment or two looking at what awaits you for the next couple of sepia weeks. 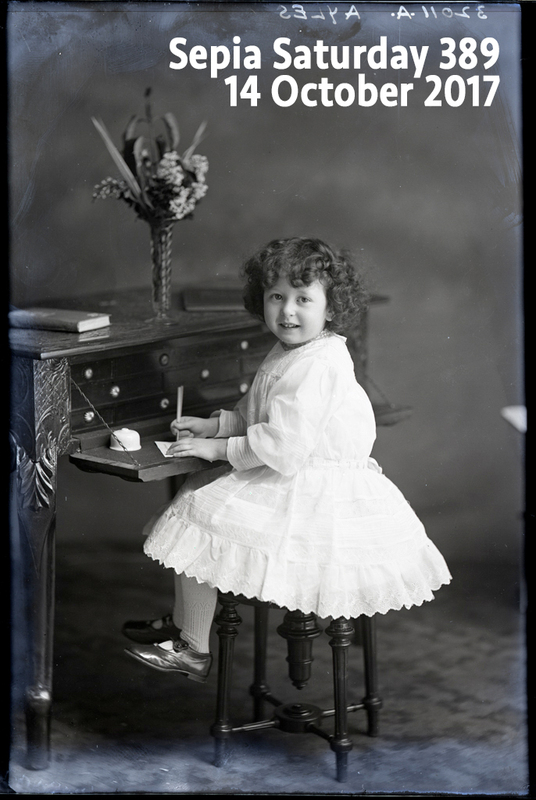 Our Sepia Saturday theme image this week is another from the Flickr Commons photo stream of the Sutton Archives (The Past On Glass) and it shows a young girl sat at a desk. 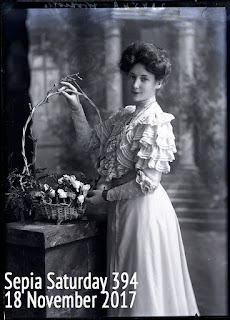 Her name was Betty Ayles and the photograph was taken in May 1911. In the same archives there is a very similar photograph of the same young girl, this time sat at a piano. Whether she is sitting at a piano or a desk there is obviously cuteness in abundance in these studies. You might want to go with cuteness or desks, writing or lighting - as ever the choice is entirely your own. Simply post an old photo on or around Saturday 14th October 2017 and add a link to the list below. The little girl in our theme image was in fact writing the list of Sepia Saturday theme images for the final quarter of 2017. These were the next two images on her list. 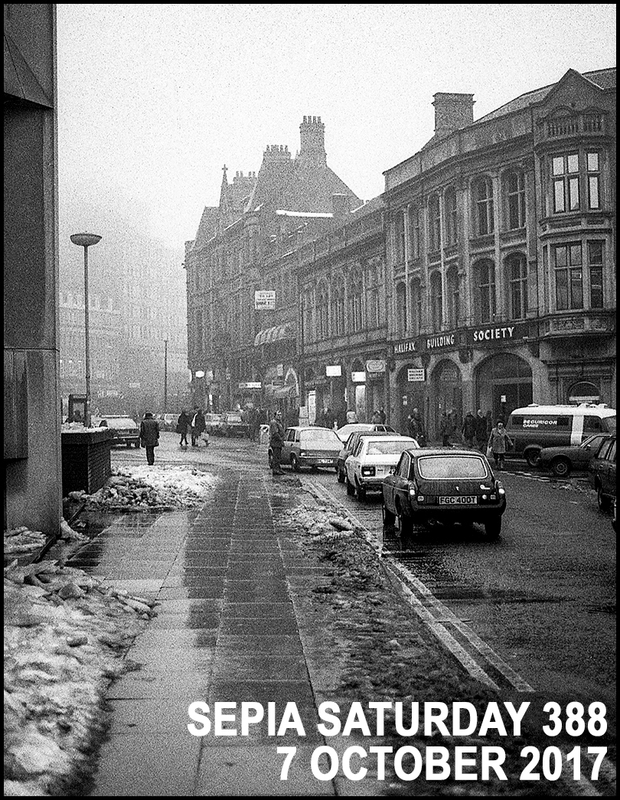 Here we go with a new season of Sepia Saturday and our first theme image provides us here in the northern hemisphere with a taste of things to come (and you in the southern hemisphere with a reminder of what you might just have got rid of). The photograph is in fact one of my old shots, taken in the early 1980s in Sheffield. I used it recently in one of my Facebook Posts and Sepian Kristin Cleage suggested it would make a good Sepia Saturday prompt (and that she had a good match for it). You can draw whatever prompts you want out of the image - cars, streets, snow, fog, city life or whatever. Once you have chosen your image and posted your post (on or around Saturday 7th October 2017), link it to the List below. Whilst you are waiting to cross the road, you might want to think about what is around the corner heading in your direction.